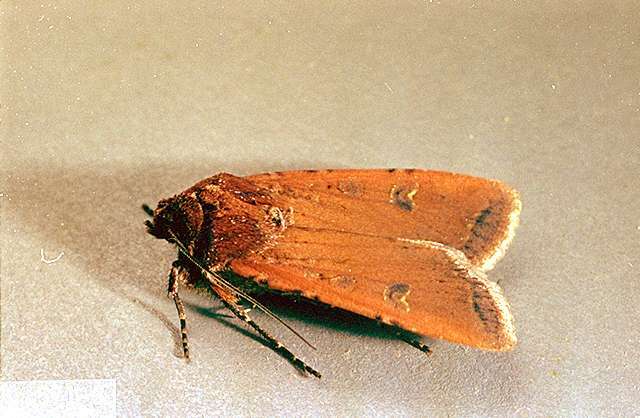 Pest description and crop damage Several species can cause significant damage to seedling-stage sugar beets, especially in fields where weedy spots or plant debris on the soil surface serve as sites for cutworm overwintering or early-season egg laying. 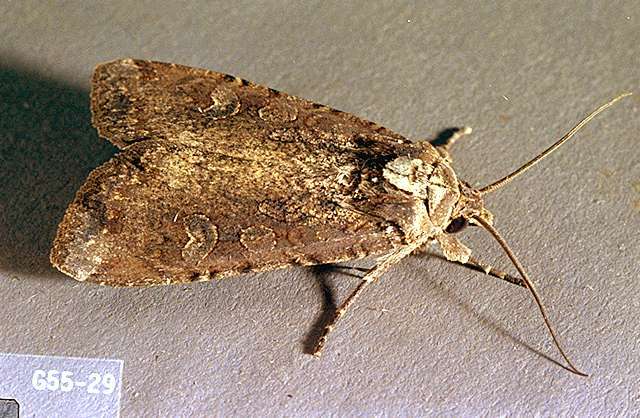 Cutworms generally are nocturnal, remaining by day just under the soil surface; so, often they are not seen until after the plant already has been damaged. 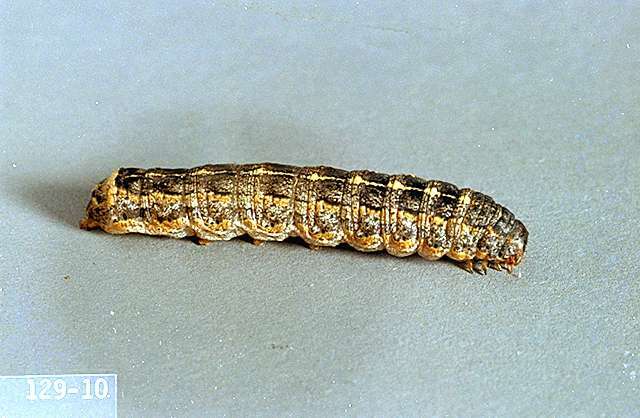 Cutworm larvae are about 1 inch when mature and vary in color from light gray to dark brown, with faint stripes or fine mottles on their smooth, hairless, soft bodies. They curl into a motionless C-shape when disturbed. Subterranean species feed on roots and stems, cutting off plants at the soil surface. Climbing species hide during the day in soil and either cut off plants at the soil surface or feed in the crown on newest leaves and stems. Scouting and thresholds No formal economic thresholds exist for cutworm insecticide treatment decisions in sugar beets. Infestations typically are very spotty, usually occurring near weedy patches or along field borders. Consider spot treating infested sites rather than the entire field. Bacillus thuringiensis aizawai (XenTari - live spores of an insect-killing bacterium)-See label for rates. PHI 0 days. 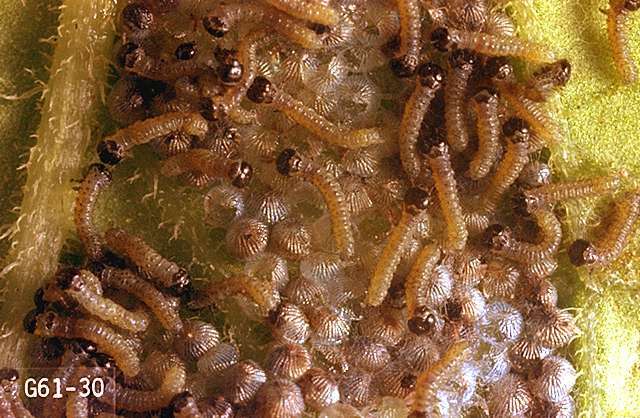 Biological insecticide most effective against small, newly hatched larvae. 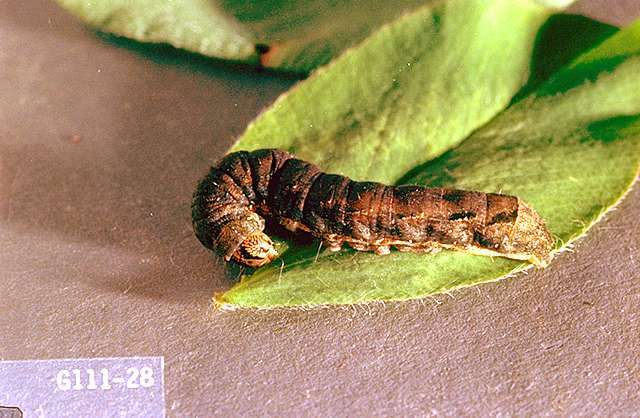 No contact action; larvae must eat treated leaves. Use a spreader-sticker. REI 4 hr. Some formulations are OMRI-listed for organic use. Bacillus thuringiensis kurstaki (Biobit HP, Deliver, Dipel DF, Javelin WG, and others - live spores of an insect-killing bacterium)-See label for rates. PHI 0 days. REI 4 hr. 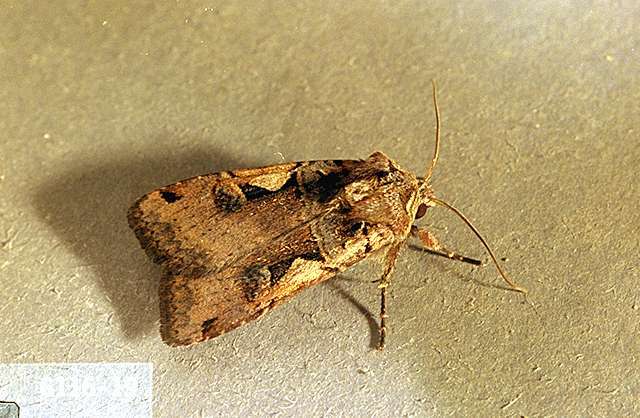 Biological insecticide most effective against small, newly hatched larvae of climbing cutworms. 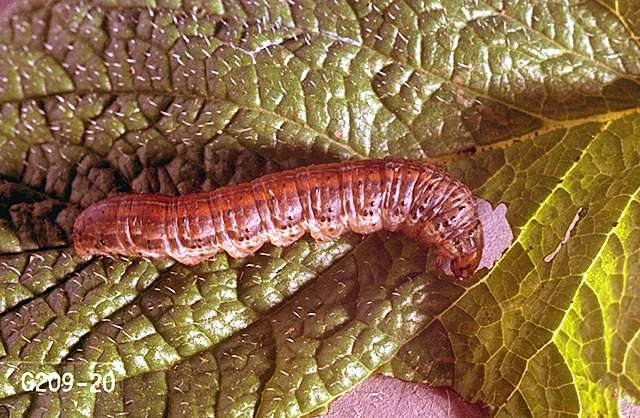 No contact action; larvae must eat treated leaves. Use a spreader-sticker. Some formulations are OMRI-listed for organic use. carbaryl (Carbaryl 4L, Sevin 4F, Sevin 5 Bait, Sevin XLR Plus, Sevin 80 Solupak, Bran For Grasshoppers, and others) at 0.6 to 1.5 lb ai/a. PHI 28 days. For Carbaryl 4L, Sevin 4F, Sevin 5 Bait, and Sevin XLR Plus, do not apply more than a total of 3 lb ai/a per crop. For Sevin 80 Solupak, do not apply more than 4 lb ai/a per crop. For Bran for Grasshoppers, do not apply more than 1.2 lbs ai/a per crop. Preplant or at planting-Apply at 0.5 lb ai/a incorporated in 10-inch band over row. PHI 30 days. Do not allow livestock to graze in treated areas or harvest treated beet tops as feed for meat or dairy animals within 30 days after last treatment. chlorpyrifos (Lorsban Advanced, Vulcan) at 0.939 lb ai/a broadcast application. Preplant or at planting-Apply at 0.469 lb ai/a incorporated in 10-inch band over row. PHI 30 days. Do not allow livestock to graze in treated areas or harvest treated beet tops as feed for meat or dairy animals within 30 days after last treatment. chlorpyrifos (Lorsban 15G, Lorsban 15G Smartbox, Pilot 15G, Saurus)-Apply at 1.5 to 2 lb ai/a in 4- to 5- inch band at planting. REI 24 hr. Do not apply granules in direct contact with seeds. Do not apply more than once per year. Incorporate into the top 0.5 to 1 inch of soil. 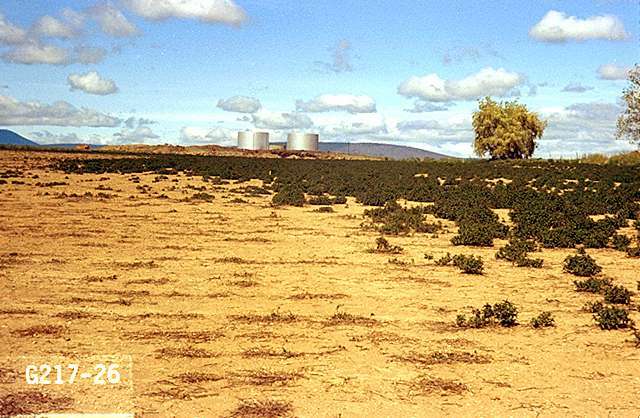 chlorpyrifos (Chlorpyrifos 4E, Eraser, Govern 4E, Lorsban 4E, Lorsban 75WG, Nufos 4E, Pilot 4E, Warhawk, Whirlwind, Yuma 4E, and others) Postemergence-Apply at 1 lb ai/a broadcast, or at 0.67 lb ai/a in a 5- to 7-inch band. PHI 30 days. Do not allow livestock to graze in treated areas or use harvest treated beet tops as feed for meat or dairy animals within 30 days after last treatment. chlorpyrifos (Lorsban Advanced,Vulcan) at 0.625 lb ai/a band application. Apply as 5- to 7-inch band, lightly incorporate mechanically or with irrigation. Postemergence-Apply at 0.939 lb ai/a broadcast, or at 0.626 lb ai/a in a 5- to 7-inch band. PHI 30 days. Do not allow livestock to graze in treated areas or use harvest treated beet tops as feed for meat or dairy animals within 30 days after last treatment. esfenvalerate (Asana XL, S-fenvaloStar, Zyrate) at 0.03 to 0.05 lb ai/a as seedling spray. PHI 21 days. Apply as necessary, but do not apply more than 0.15 lb ai/a per season. Apply with ground or air equipment using enough water (at least 2 gal/a) to coverage uniformly. 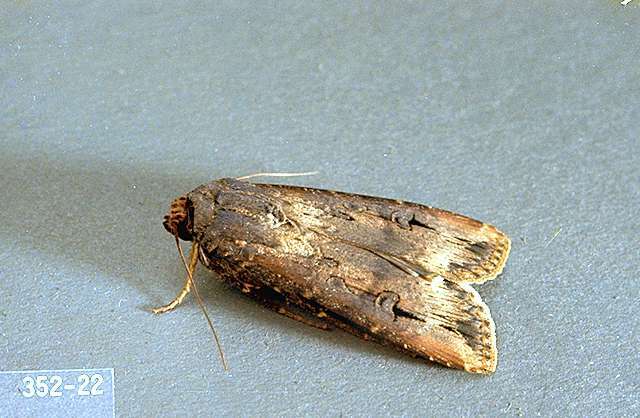 methomyl (Annihilate LV, Annihilate SP, Corrida 29 SL, Corrida 90 WSP, Lannate LV, Lannate SP, M1 LV, M1 SP, Nudrin LV, Nudrin SP) at 0.45 lb ai/a for variegated cutworm. PHI for roots 21 days or 30 days if tops are fed to livestock. REI 48 hr. Do not apply more than 4.5 lb ai/a per crop or apply more than 10 times per crop. methoxyfenozide (Inspirato 2F, Intrepid 2F, Invertid 2F, Troubadour, Withstand, Zylo) at 0.12 to 0.25 lb ai/a. For suppression only. Apply at egg hatch or when signs of feeding occur. PHI 7 days. pyrethrins and piperonyl butoxide (Pyrenone, Pyronyl Crop Spray)-See label for rates. spinosad (Seduce) at 0.014 to 0.031 lb ai/a. Soil-applied insecticidal bait that attracts and kills insects; use standard broadcast spreader for broadcast application or standard granular spreader for row application. Do not apply more than four times per crop (more than 0.33 lb ai/a per crop) or less than seven days apart or more than three times in any 30-day period. PHI 3 days. Some formulations are OMRI-listed for organic use. terbufos (Counter CR Lock'n Load, Counter 20G Lock'n Load, Counter 20G Smartbox, Counter 15G Lock'n Load, Counter 15G Smartbox) at 1.2 oz ai/1,000 row feet-for suppression only. Apply at planting in a 5- to 7-inch band over the row and lightly incorporate. Do not allow granules to contact seed. Only one application per year. Do not exceed 2 lb ai/a. PHI 150 days. (Mustang) PHI 50 days. Do not apply more than 0.15 lb ai/a per season (at planting/foliar applications). At planting application-Apply at 0.05 lb ai/a on soil surface in a 5- to 7-inch band, or broadcast in at least 3 to 5 gal/a water. Foliar application-Apply at 0.028 to 0.05 lb ai/a with equipment for ground or air application, using enough water to fully cover foliage. At planting-Apply at 0.025 lb/ai/a. Apply on the soil surface in a 5- to 7-inch band or broadcast In a minimum of 3 to 5 gal per acre.